Please join Larry's family for a luncheon in the Life Story Center following the service. Although his life came to an end without warning, Larry Kroll made an impact in the lives of those around him. He was a bit of a free spirit who was generally quiet - unless he was talking about politics! 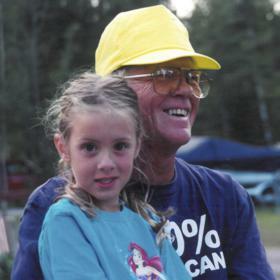 A devoted husband and father, Larry was thrilled to be part of his granddaughters’ lives. He worked hard, but he played hard, too, and his love for life was easy to see. Although he will be deeply missed, Larry leaves behind a priceless collection of memories that will be lasting treasures in the hearts of his family and friends. During the first half of the 1940s, all eyes were focused overseas as countless young servicemen and women were serving during WWII. Those who remained stateside became familiar with rationing on common goods while families eagerly awaited the latest news from the front lines. 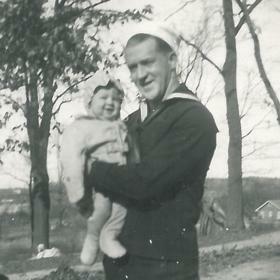 Amidst this eventful time was a time of great joy in the lives of Clayton and Jeanette (Haken) Kroll as they announced the birth of their son Larry Lee on April 14, 1944, in Baltimore, Maryland. He was the oldest of three in his family as he had two younger sisters, Diane and Karen. Larry’s father worked at a factory while his mother worked as a presser at a dry cleaners. Raised in Whitehall, Michigan, Larry was a bundle of energy. He once shot a bear on television using his BB gun, and his mom promptly told him, “Just wait ‘til your father gets home!” There was the time when he lit sparklers under the blanket, putting several burn holes in his bedding! Larry was known to skip school on a fairly regular basis, often hiding out in the woods with his buddies. He played the cornet in band as a student at Whitehall High School, graduating in 1962. Not to be forgotten during Larry’s years in school was his introduction to the young girl of his dreams. She was a young Muskegon High School girl named Sandy, and they met at a VFW dance in Montague. Larry gave her a rose he had taken from his neighbor’s yard. They were just 15 and 16 at the time, but true love soon followed. 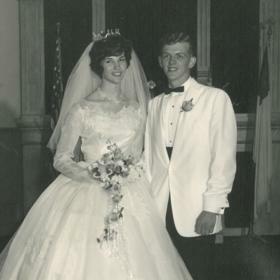 With a desire to spend the rest of their lives together, Larry and Sandy were married on June 6, 1964 at First Congregational Church in Whitehall. They spent their wedding night in Cadillac. The newlyweds lived in Muskegon for a short time, but Larry and his wife soon moved to Chicago where Larry attended DeVry Tech for electronics. They moved to Kalamazoo in 1966 where they lived in a few places before finally settling into their current home where they spent the past 47 years. Together they welcomed two children including Sean in 1967 and Danielle in 1970 into their hearts and home. To support his family, Larry worked as an electrician, retiring from Severence Electric in 2006. For most of his life they had dogs, and most recently they have had a German Shepherd named Dalilah. Larry’s son has four German Shepherds that are all related; these four dogs are lucky enough to seem to have two homes as Larry and Sandy frequently took care of them. Throughout his life Larry was a man of many interests. Larry enjoyed being outdoors; around home he could often be found out in his large vegetable garden working for hours on end. For more than 40 years Larry and Sandy and their family has camped at Leelanau Pines Campground enjoying their time in the seasonal trailer they have maintained there since 1998. Larry and Sandy enjoyed the times they were able to just hang out with their friends, often having campfires, making s’mores, and feeding marshmallows to raccoons. They loved taking the granddaughters up to Lake Leelanau for three weeks in the summer. These were such special times as Larry enjoyed taking them tubing, listening to them scream and just having a great time. 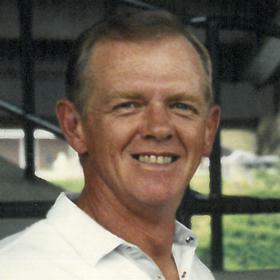 Larry liked fishing, and he also played golf, primarily at Eastern Hills. For years he and Sandy bowled in a couples league and individual leagues. Larry enjoyed relaxing with some television as he liked watching golf, fishing, car garage shows, and all the Alaska shows. He was often surfing the web and keeping up on the political heartbeat. Larry was very handy and got into woodworking. He even made the nightstands to match their bedroom set. He never was one to shy away from sharing his opinion. He had a sweet tooth, loved his tacos, Black Velvet with Diet Coke, and since he was 13 years old Larry smoked his Camels. All who knew Larry Kroll would agree he was the sort of person who did things his own way, and with his strong determination he accomplished whatever he set his mind to. Larry had a dry sense of humor that seemed to emerge at the oddest of times, and he loved making others laugh. He was usually quiet, but he did enjoy talking about things he was passionate about. With a deep devotion to his family, Larry loved being a husband, father, and grandfather. Life will never be the same without him here, but he leaves behind a timeless legacy that his family will proudly carry on in his footsteps. Larry L. Kroll, of Kalamazoo, died on October 18, 2018, at his home. Larry’s family includes his wife, Sandy Kroll, 2 children: Sean Kroll of Augusta MI and Danielle (Ben) Thomas of Durham NC, 2 granddaughters: Samantha and Madison Thomas; sister, Diane Kroll and many nieces and nephews. Larry was preceded in death by his parents and sister, Karen Ludholtz. Cremation will take place. Services will be held Thursday 11 a.m. at Betzler Life Story Funeral Home, 6080 Stadium Dr. Kalamazoo (269) 375-2900 followed by a luncheon in the Life Story Center. 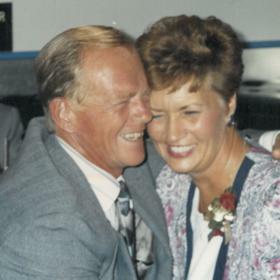 Please visit Larry’s personal web page at www.betzlerfuneralhome.com, where you can archive a favorite memory or photo and sign his online guestbook before coming to the funeral home. Memorial contributions may be made directly to the family.